Optimum settings for T300 RS? Discussion in 'General Discussion' started by avenger82, Mar 17, 2018. What are recommended settings for this wheel? But, I’m not sure if it applies to rF2. I guess overall settings like max torque, spring force 100%?, min force 2%. will be the same. But for instance how about FFb smoothing? 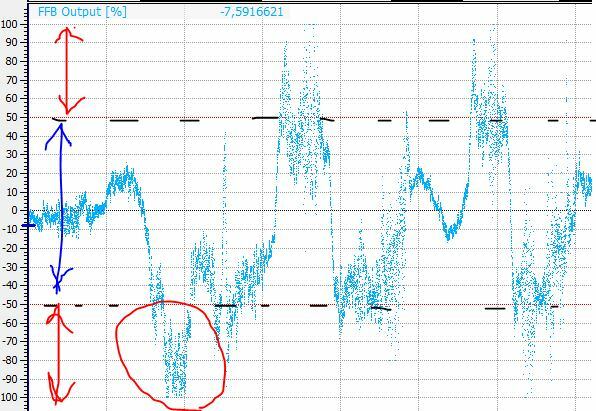 The only reason to have FFB smoothing above 0 is for noise. My T500 is fine on 0, I would say your T300 should be fine on that also. My TS-PC is also running 0 smoothing. Sherwin92, mesfigas, patchedupdemon and 1 other person like this. Never been sure about the spring and damper thing, set them on zero for ages with a Logitech wheel then after a windows reinstall I didn't bother, and didn't notice anything awry. Haven't put them on 0 since. Just read this and tried it for a couple of minutes earlier, don't know if I was feeling a difference or just placebo. What it actually does is all up to software, the T500 is able to make use of those if implemented I think, but not sure it's actually doing anything with rF2's 400Hz FFB. I get the impression it would be more useful with a lower FFB rate. OP: just be careful you don't clip your FFB, some mods you'll need to adjust the FFB mult down to 0.6 or 0.7. In iracing the spring and damper in the tm control panel don’t do anything,the game does it for you. Why not use Overall FFB at 100% and then in game set((lower) car specific FFB multi? I actually have overall FFB = 100 % and for instance in AC use FFB Clip app to dynamically reduce Gain. I’m also not sure what Spring does in rF2 but will set it to 0. - Filter............. 0, 0, 0 and 0 !!! We want RAW FFB. That is for T500, but... hope it can help for T300 setting. With logitech wheels the default strength is 100%, going higher is said to make the FFB clip at higher outputs. T500 defaults at 60% and some say higher will either start clipping or really compress the high end, leading to less feel. T300 I think is 75% and similar things are said. It's not easy to test unscientifically, I tried 100% on my T500 and I could still feel changes with the FFB output ranging around 70-100%, but it's possible I was only feeling the dips and the output closer to 100 was being lost or heavily compressed. Some people test using a 'wheelcheck' program which I think makes some dubious assumptions about output power vs unloaded wheel travel, I don't know if anyone's bothered to hook up some sort of meter and do it properly to see how linear the wheels are (or aren't) on various power settings. So, the theory is the default power will give you the most linear response, which rF2 is designed for. Going higher probably won't make the max forces any stronger but will tend to boost the low- and mid-range forces, which depending on the car and your tastes might be a good thing. This makes much more sense to me. Luckily for you it also happens to be using your wheel so you don't need to do your own tests. These results are obviously better than the widely circulated WheelCheck graphs, and are closer to a real use situation as well (generally when you're feeling forces the wheel isn't moving very fast, plus your hands are attached to it). So I'd tentatively suggest 100% in the control panel and scaling down in the game for cars is the better option. This will make no difference in basically all mods. It's a setting designed for powerful wheels, normal consumer wheels don't exceed the true force levels and therefore don't need to be scaled down (which is what this setting will do, when set to a high enough value). I haven't read it in depth, but it seems test methodology was enough for accurate measurements. It doesn't mean wheelcheck is totally flawed, because as I understand it applies to linear force test(which oc is importand). Other tests may be more accurate. Anyway looking and the graphs in the post it seems to me 100% overall force is the best option. Of course car specific FFB multi should be lowered to avoid clipping. I suggest using the default value. But I am not an expert. Overheating. I keep mine at 75% ish. People who say 'T300s are crap I've had six and bla bla blaaaaaa' are people that cranked it to 100% and it melted the innards. I did all the WheelCheck.exe tests as per the Main Thread in this forum some time ago, I need to revisit the whole FFB Settings one day but time is of the essence and I spent far too long faffing around with it last time. When/If we get an FFB Clip App (*see below) then I'll take another look, for now the settings below are good enough. Specific Car FFB (or whatever it's called) = 1.00 *I don't currently change this due to a lack of FFB Clipping App in DX11. It's probably a fair bet they also had clipping all over the place, so maybe 100% but with properly adjusted FFB would be fine. Hard to say definitively of course. @MarcG telemetry can capture FFB output to test clipping, so you don't need to be helpless in dx11. @avenger82 I know about that test, I even linked to it in my post. And talked about it. @MarcG telemetry can capture FFB output to test clipping, so you don't need to be helpless in dx11. Yeah I was told there's a MoTeC plug in or something but it seems like a lot of effort when in DX9 it was a simple option on screen, is it a lot of work to set up? If not I may look into it, I may of said that in the past and forgot about it too! Imo in the TS system setup only periodic and master has influence for rf2. telemetry can capture FFB output to test clipping, so you don't need to be helpless in dx11. Looked at the telemetry but could not find the FFB output. Could you point me in the right direction Lazza? @Larry Thomas Depends which telemetry solution you're using. If you're using DAMPlugin you need to enable the channel group that contains FFB Output in the DAMPlugin.ini file (first post in the DAMPlugin thread links to a post with [nearly] all channels listed in their groups). It's not enabled by default. I'll share what I did with my T500, maybe it could help you: with WheelCheck I noticed that at 90% of control panel strength, I get a very linear response from 0 to ~50% of input force. If I set ~60% of control panel strength I get a linear response from 0 to 90% of input force, but the max real strength at the wheel and wheel acceleration is much lower than the previous test, verifiable with RFRWheelTest). In AC there is the possibility of using a LUT, which makes the other 50% available, "converting" it into linear. 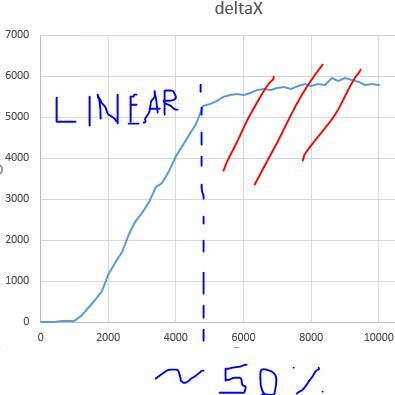 However, we can see from deltaX that the last 50% gives a loss of (6000-5200)/5200=~15% of torque. Which in my opinion can be sacrificed. So what I do is to leave control panel at 90%, because I like the strength. Using the DAMPlugin with FFB Output, I adjust FFB multiplier to make forces fall inside the 0-50% of linearity as much as possible. In this way I get a nice linear response when driving normally and big punches when on kerbs. I'm not sure of the goodness of measuring data with WheelCheck, I guess a proper spring force gauge would be better than assuming torque from rotations (it does not count the effects of friction, which depends on speed). But it's a start. It's not the best way, but with this I can fast adapt with every game: I just have to lower game force. WheelCheck results are different for every rim that I use because of different inertia. I have two custom wheels, Sparco and OMP, both under 800g, but I would say that ~600g is the ideal for custom wheels (the original wheel without the hub weighs that much). In game: FFB multiplier from 60 to 80%, varies from car to car. 0% minimum torque. FFB smoothing from 0 to 3, I can't really tell much of a difference, but I guess higher values should wear less the motor and the electronics if FFB is smoothed? adamfarmer and deni80s like this.